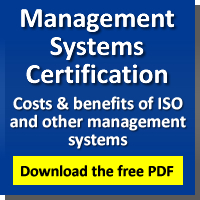 This free PDF download walks you through Management System common principles, requirements, and required documentation. It is everyone's job to support and protect a safe and healthy workplace by preventing injury, preventing ill health, reducing hazards and continually improving the OH&S performance. Organizations are becoming increasingly concerned in achieving sound health and safety performance, often while delivering cost savings and demonstrating Good Stewardship and Good Corporate Citizenship.